I had to step in and play a character this week, as one of the players has had to stop playing due to other life commitments. Unfortunately, it meant he also missed out on some more custom content, which I am sure would have appealed to him as a fellow builder. Actual play went smoothly enough, although Grimbold (the character I took over) did get dispersed once (died), which probably does not say a lot about my ability to play. I did manage to kill the creature as it killed me though, so that is something. There were a few very minor issues, the first of which I have addressed in patch v1.04: If a player has their PC click on a Lore Tome to learn it (but does not need it), it is supposed to be left on the ground for other players to try for their own PC. However, there was a variable that prevented this from happening, which I have now addressed. The other two issues are old ones, which I thought I may have cured, but still come back to haunt us now and then. The first one is "mixed tokens", which basically has the players see each others stats when clicking on a menu at the same time. However, this only appears to occur if one player is playing remotely rather than on a LAN, and I believe it is to do with the speed of the Internet connection and the passing of data. The simple quick fix is to simply reopen the Main Menu, but it is something to be aware of when playing such a game. If I do ever find a definite solution, I will add it. The problem is, I can add a variable that checks between each player accessing the conversation, but I am worried the conversation could lose the variable in network traffic and prevent the Main Menu from opening altogether and so I don't want to go down that route if I can help it. The second issue is to do with monsters appearing "friendly" when first encountered. Again, I have checked the code, and I cannot see any reason why this is happening, and it appears to correct itself after a short while anyway. The quick easy solution to this one for the time being, is to right click and select attack. Hopefully, these minor glitches will not show themselves too often anyway. Otherwise, the group handled the toxic areas well, even under the added stress of combat. They also finally managed to gain access to the sewers and locate the elevator and discover what the problem is. Now, they just need to fix the problem so that they can reach the ground level! 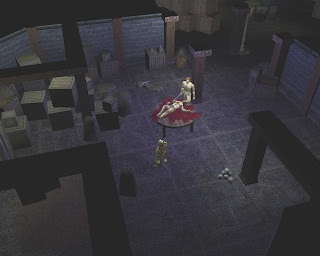 "There were many bodies in this area, many mutilated and left as bloody corpses throughout the area; one had even been left on a table.... Just as Karasten reached the farthest point within the chambers, a sudden known cry echoed all around the group, "Give me flesh!". In that instant the group realized more Death Walkers had tracked them down and combat was engaged. There was nowhere to run from here and the heroes had to stand or fall." Read the full synopsis here.